So – we all know my obsession with all things Alcott, right? Well, this summer at the Summer Conversational Series, I met Jeannine Atkins, who was quite charming, and she was speaking about May Alcott and her new novel about her (which came out in September). Of course I NEEDED this book and right away. Jeannine kindly gifted me with an ARC and I tucked it away so that I could savor it. If you know me, you know that I am very, very picky when I read about the Alcotts. If stories don’t fit what I deem to be true and right, well then I don’t want any part of it. I’ve been know to stop reading a book, shout “Hogwash!”, and actually toss it away if it contains what I perceive to be Alcott sacrilege. Jeannine was such a genuinely nice person that I had my fingers crossed that I would not be doing any book tossing! Well, no worries. This book is an absolute delight. Right from the first pages I knew Jeannine had done her homework. There is SO MUCH of the real Alcotts included in her pages, from things they said to the flowers they picked to the food they ate to the people they visited. This book is so on target that I know Jeannine had to have spent hours reading and digesting the real journals and letters of the family. Kudos to her! 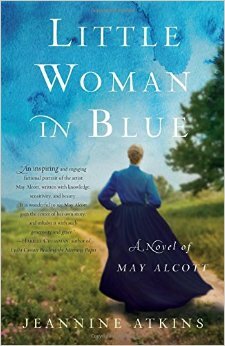 If you only know the Alcotts as the family of Little Women, then you are in for a treat. Even if you only know me peripherally, you know that I am always talking about the whole family and how fascinating they all were. May is my favorite. Sweet, beautiful May (“Amy” for you Alcott newbies) was the youngest, the most beautiful, the most vivacious, and the talented artist who spent her late teen/early adult years developing her art, teaching art to the young people of Concord, and drawing on the walls of her bedroom at Orchard House (still seen today!). May was determined to see and study in Europe and to become a true artist. This book is May’s story — her friendship with Julian Hawthorne, her complicated relationship with Louisa, her love for her family, and her struggle to become an artist when female artists were not encouraged. It is also May’s love story of her relationship with Ernst and her dream of one day being both an artist and a mother. Now I’ll be honest — SPOILER ALERT — I dragged out this book so that it didn’t have to end. I cried the last three chapters because I know what was coming. I just have always loved May (the REAL May, not “Amy”). I loved this book so much! Jeannine, if you are reading this, I am sending you a virtual hug because I’m just so happy that you portrayed the Alcotts so realistically. Thank you so much for your beautiful novel of “summer’s golden child”. To the rest of you – even if you are just a little bit curious, go out and get this book – pronto! You can thank me later.